The 4th of July is a special day in the United States. We celebrate our independence with parades, parties, and fireworks. 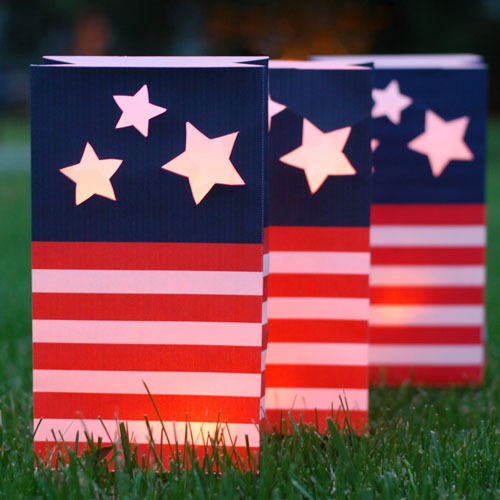 Give your party some extra special ambiance with red, white and blue luminarias. 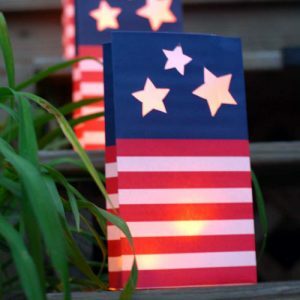 A free Fourth of July lantern project patriotic holiday luminary printable is available for you to download from easypapercrafts.com. All you have to do is print, cut and fold the Fourth of July luminary project to add ambiance to your party. Just download the free fourth of july lantern craft printable and print out on 11x 17 paper, then cut and glue the tabs. Easy peasy! 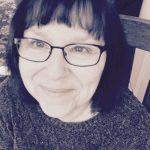 If your printer doesn’t handle 11×17 paper, you can have it printed at a quick printer ( such as Staple’s or Kinko’s) for a small fee. It is a good idea to follow safety tips, and use battery operated tea lights instead of candles. Much safer . . .
Line your walk or driveway, or deck stairs with luminaries for a stunning effect that will encourage fun and festivity at your gathering.